We first wrote about the LEVL fitness tracker more than a year ago, and now the startup behind it is ready to launch the first version that's aimed at wellness professionals to help clients make sense of the data. It's called the LEVLpro and the concept remains the same as the consumer version (which is still on the way). This is a device that is capable of capable of knowing when your body is burning fat or energy using an innovative breath sensor. Yes, we know it sounds odd, but here's the scientific breakdown of how it works. The nanosensor can detect acetone, which is a byproduct of the human metabolism and is released when you breathe. It measures parts per million of acetone concentration in the breath, which correlates directly with the body's state of fat burning. According to the company's website, "When the body is burning fat for energy, it is in a state called ketosis. During ketosis, the body generates molecules called ketones, one of which is acetone. Because of its small size, acetone appears in our exhaled breath as an indicator of fat burn." The sensor can analyse the concentration of acetone and translate that to fat burn, which can then be viewed in real-time via the companion app. Apparently, this is a more reliable way of detecting fat burn in real time, than a jumping on a set of scales because it only takes into account body weight, which isn't an accurate representation of fat loss. We couldn't take part in a demo because chewing gum is apparently a no-no before taking a reading, but we did get to see exactly how the process works. Inside the unit lies two small devices, and once you've taken one out and wait five seconds, you can then blow into it. Once completed, you drop it back into the unit, close the lid and the analysis part of the process is signalled from the colourful display on the front. After 20 seconds, the information is sent wirelessly to a companion app where you can see a LEVL score and further insights into what that data actually means. The idea is that wellness professionals are then best placed to make sense of the projected fat-loss data and help clients adjust fitness plans. 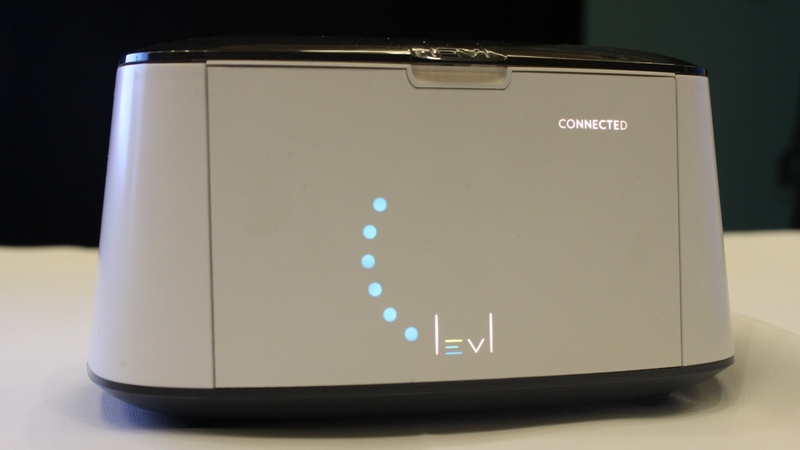 The LEVLpro is going on limited release in Seattle with the device costing $199 per month to use. There is still a consumer version on the way as well and more details about availability is expected to be announced in March.